2-Sided vertical multi-card holder. Side load with slot & chain holes. 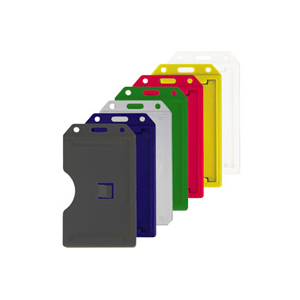 Holds one 30 mil (750 mic) id card on one side and up to three 30 mil (750 mic) id cards or six business cards on the back side. Insert size 3 1/2" x 2 3/16" (89 x 56mm).